Lighting is fundamental to a positive guest experience but is often overlooked by guests unless there is a problem. A dimly lit corridor or too harsh lighting at the hotel bar in the evening can garner negative comments, but a properly lit space is often accepted without major fanfare unless it is tied to a unique architectural feature or is itself the feature. A well-designed lighting plan with proper lighting fixtures and control capabilities can be the underdog supporting the hotel brand experience. Light layering that combines ambient, accent and task lighting creates a visually comfortable and appealing space. Pre-set lighting scenes in common areas maintain proper light levels even as the use of these spaces changes throughout the day. Lighting can support the desired ambiance sought by the specific type of traveler the hotel is targeting—whether that be luxury, business, family or backpacker—and will help deliver the hotel’s brand promise. In a hotel setting, lighting provides proper illumination for certain tasks and safety, but also helps set the appropriate mood or ambiance of a space. 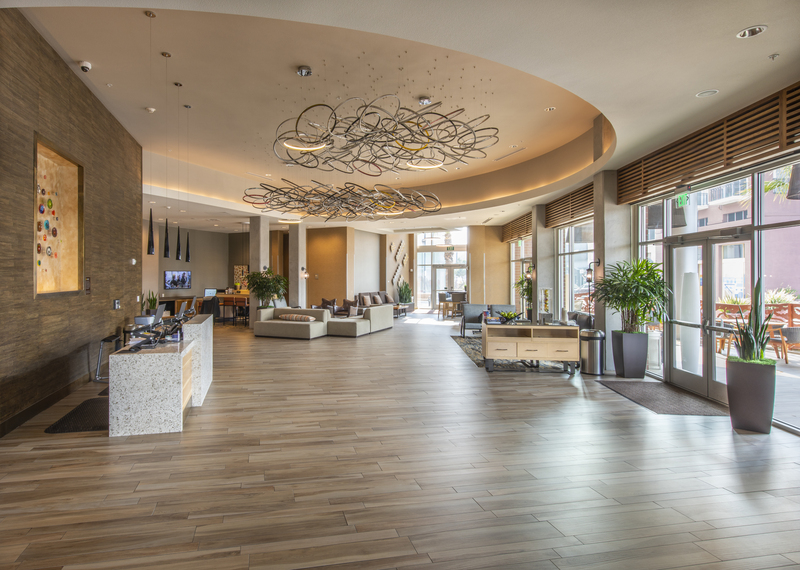 Lighting is essential for guest comfort, staff productivity and overall security. Its needs vary widely across a property and between indoor and the building site. The perfect lighting levels in hallways make them inviting rather than desolate. Illuminating the site including entryways and parking areas helps guests and staff feel safe upon arriving and departing from a property. Service areas such as a kitchen or behind a bar require light levels that are tuned to specific tasks. In the hotel industry, ambiance is particularly important and tied to the brand. Proper lighting invites guests to linger in a space, while poor lighting can have the opposite effect. Many hotel spaces use multi-purpose common areas for convenience and to control costs. These spaces change frequently throughout the day or week to accommodate guest needs and additional contracted rentals of function space. A dining area may start the day with a buffet breakfast then change to a more intimate bar and restaurant in the evening. Ballrooms that host weddings on weekends support conservative executive meetings during the workweek. Conference rooms will transition from bridal showers and social events to team-building meetings for corporate clients. Although the activity within the space may differ, having proper lighting to set the mood and support specific tasks, is consistently a requirement. When a space needs to change to accommodate a different use or time of day experience, it requires a new setup. The setup may involve changing the layout of a room or adjusting the number of tables and chairs used. Pre-set lighting scenes can quickly adjust lighting to reflect the change space usage and ambiance. This can be done quickly and reliably while ensuring a quality experience with a centralized light management system. Energy represents a considerable cost of a hotel’s operating budget so installing energy efficient lighting is a must. According to Lodging Magazine, HVAC and lighting are responsible for 45% of hotel energy usage. Today’s connected lighting control systems allow hotel managers to incorporate energy-saving strategies such as occupancy sensors that dim lights when spaces are unoccupied, or daylight harvesting techniques that reduce the amount of artificial light used in building interiors by leveraging natural daylight when available. As daylight levels vary, individual fixtures or zones can be programmed to dim up or down so that illumination is maintained evenly at the desired level throughout the space providing a positive guest experience while saving energy costs. Hyatt Place, Emeryville (San Francisco Bay area) was constructed in 2016 and is designed around the needs of the modern international traveler. Situated on the Bay overlooking San Francisco, it is a casual chic hotel located within minutes of many of the Bay area’s popular attractions. It consistently receives 4-5 star traveler ratings. The Hyatt team chose the ENCELIUM® EXTEND Networked Light Management System (LMS) for centralized lighting control of interior common spaces and the building’s exterior site. The first-floor lobby, social lounge, bar, breakfast area, conference rooms, fitness area, corridors and elevator lobbies on all floors, leverage a range of lighting control strategies in compliance with Hyatt standards in meeting guest comfort, worker productivity and energy efficiency/cost control. The ENCELIUM EXTEND System also controls the exterior site lighting including the hotel’s entryway, patio, walkways, and carport area. Combining interior common space and building site lighting into a centralized control system streamlines management tasks.